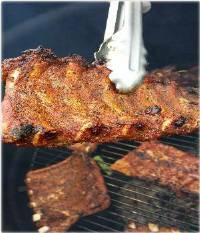 This is a simple, easy and quick BBQ dry rub recipe for ribs. The best part is that it works every time and doesn't take much effort at all. BBQ Ribs can be cooked in the oven or on the grill. There are a couple of methods for flavoring Dry Rub ribs prior to barbecuing on the grill. Before you add Dry Rub seasoning, be sure to remove the silvery membrane that runs along the bone-side of the BBQ ribs. The membrane is like a fibrous skin that will block the flavor of spices and marinades from penetrating the meat. If you aren't comfortable trimming it yourself, ask your butcher to remove the membrane for you. Once the membrane has been removed and the ribs thoroughly washed and dried follow these steps to season and cook. On a long platter or pan lay out two strips of aluminum foil. Once done lay the ribs either side up. Take the 5 Oz container of Jake's Tri-Tip, Steak and Rib Dry Rub our best dry rub for ribs and shake generously on the ribs using the provided sifter. Once the side has been coated turn the ribs over and generously coat again. Fold the foil over to completely seal the ribs in foil. At this point some will ask why didn't I rub in the dry rub? Well if you must rub you can squeeze the foil from bottom to top pressing the dry rub into the meat prior to marinating. Take the wrapped ribs and place in the refrigerator for 1 hour or more to marinate. If using a charcoal grill now would be a good time to light the grill. Following lighting instructions on our website (Lighting Instructions) if you have questions. With the ribs marinated and grill ready remove the foil from the ribs and place on the indirect side of the grill. Let cook for 15 minutes with the grill lid closed. After 15 minutes open the lid and turn the Dry Rub ribs over then let cook for 18 minutes. After 18 minutes check the temperature. We added 3 minutes to the cooking process to account for the heat loss during the opening and closing of the grill. After each subsequent turning check the temperature using an instant read thermometer. As the ribs near finishing temperature begin consulting the cooking chart to ensure that you bring the ribs out at the right temperature. You can make this Ribs Recipe using our Jake's BBQ Dry Rubs for Ribs and Jake's Really Good Righteous BBQ Sauce. Just apply the BBQ Sauce before the last turning then cook until done. If you'd like to blend your own version of BBQ dry rub recipe for ribs using a BBQ dry rub recipe posted on our site select one of our many BBQ RIB RECIPES on our website or select a recipe like: Baby Back Fennel Ribs to make the BBQ process easier. Here's our cooking chart as reference for BBQ dry rub recipe for ribs and more. Cooking Pork Rare or Medium Rare is not recommended (Medium Well and Well is Preferred). Special Offer: Use code 1707200910 now and take 10% off any of Jake’s products. Just use the code at checkout and take 10% off Now.